The lAU Symposium No. 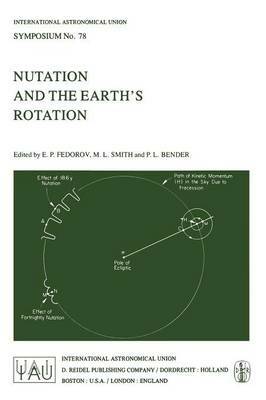 78, "Nutation and the Earth's Rotation," was held in Y~ev, USSR, from 23 to 28 May, 1977. The Organizing Committee included E. P. Fedorov and R. O. Vicente (Joint Chairmen), W. Fricke, J. Kovalevsky, P. Melchior, N. Pariisky, M. Rochester, C. Sugawa, G. Wilkins and Ya. Yatskiv, who presided over the Local Organizing Com- mittee. The meeting was sponsored by Commission 19 and co-sponsored by Commissions 4, 8, and 31. There were 114 registered participants from 14 countries. The main topics covered were as follows: the specification of nutation in the lAU system of astronomical constants; determination of forced nutation and nearly diurnal free polar motion from astronomical observations; expected use of lunar ranging data and long baseline interferometers for precise measurement of the nutation terms; models of the internal constitution of the Earth as the basis of a new theory of nutation; the effect of the ocean and liquid core on the rotation of the Earth; and the interaction between Earth tides and nutation.